Rachel Von | The Journal Gazette The Komets' Taylor Crunk moves the puck towards the net during the first period against Cincinnati at the Coliseum on Saturday. 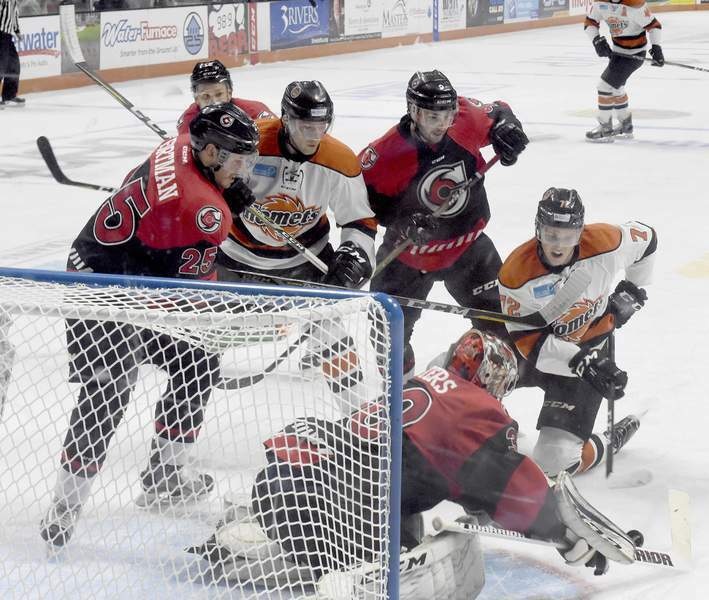 Rachel Von | The Journal Gazette The Komets' Joseph Widmar, far right, tries to get the puck as Cyclones teammates try to protect the net during the first period Saturday at the Coliseum. Rachel Von | The Journal Gazette Komets' Jamie Schaafsma, left, tries to get ahold of the puck as Cyclones' Blake Thompson tries to get the puck during the first period of the game against Cincinnati Cyclones at Memorial Coliseum Saturday. Rachel Von | The Journal Gazette The Komets' Shawn Szydlowski, left, shoots the puck as Cyclones goalie Anthony Peters tries to protect the net during the first period Saturday at the Coliseum. Rachel Von | The Journal Gazette The Komets' Joseph Widmar, right, moves the puck closer to the goal as Cyclones' Mike Barrett tries to stop him during the first period Saturday at the Coliseum. Rachel Von | The Journal Gazette From bottom: Cyclones' goalie Anthony Peters tries to protect the goal as teammate Chris Leone tries to block Komets' Daniel Maggio as he shoots the puck during the first period Saturday at the Coliseum on Saturday. Great goaltending can make up for a lot. The Cincinnati Cyclones’ Anthony Peters reinforced that age-old hockey idea tonight, making 37 saves to lead his short-handed team to a 4-1 victory over the Komets in front of 7,189 fans at Memorial Coliseum. 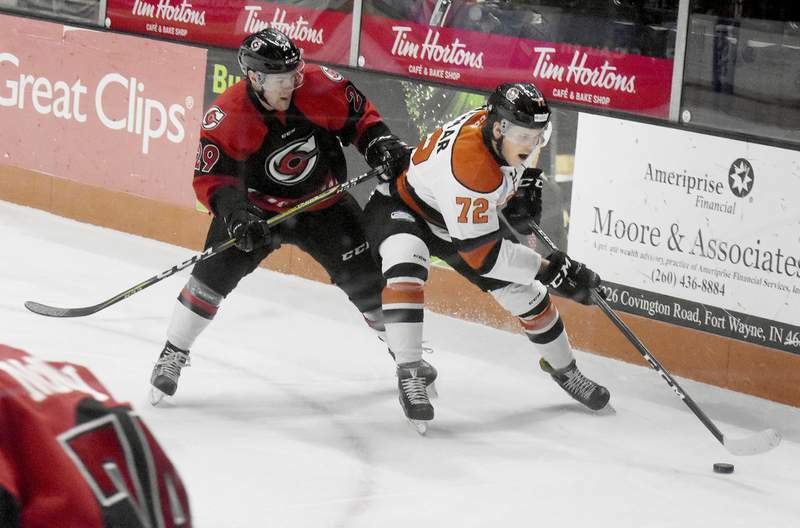 An early two-goal deficit was too much to overcome for the Komets in the second of nine meetings between the teams this season. The final score wasn't necessarily indicative of how close the game was, though, not since there were two late empty-net goals by the Cyclones, who have won three in a row. Despite playing two men short of a full 18-player lineup because of a barrage of injuries, the Cyclones were able to score the only two goals of the first period. Justin Danforth scored the first, at 7:07, by getting to the rebound of a Sean O’Donnell shot and chipping it into an open net. 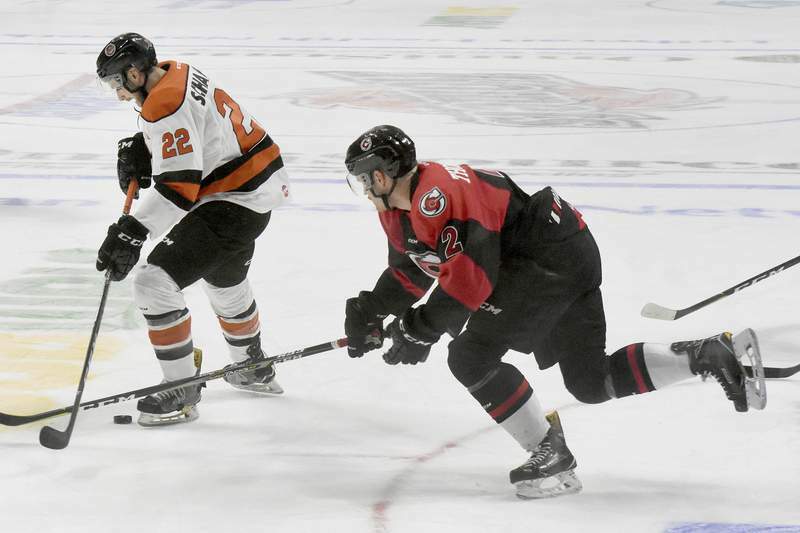 Cincinnati made it 2-0 after a Danforth shot from the blue line was stopped by Komets goaltender Michael Houser, who played last season for the Cyclones, and Jesse Schultz was able to put another rebound in at 9:09 – on just the Cyclones’ sixth shot of the game. 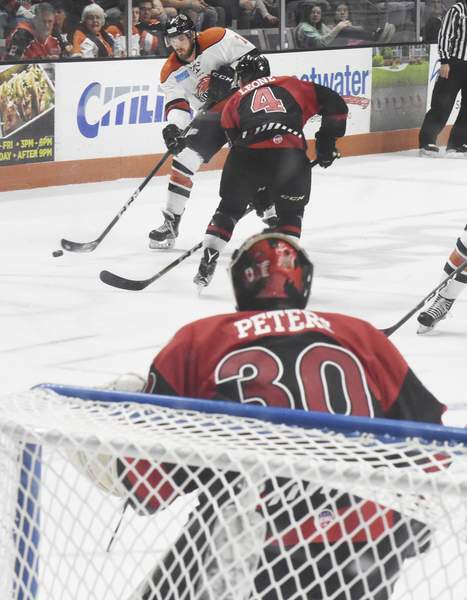 The Komets had 25 of the first 40 shots on goal but Peters kept it at 2-0. His saves included a sprawling stop of Zac Larraza 11:50 into the second period, after Cody Sol’s pass from deep in the defensive zone set up a 2-on-1 rush. The Komets’ physical aggressiveness put them in position to make a comeback; Fort Wayne’s Taylor Crunk and Louick Marcotte fought, respectively, Chris Leone and O’Donnell late in the second period putting the Cyclones four men short of a full lineup to start the third period. However, the Cyclones found themselves reinvigorated when they got a five-minute power-play thanks to a Sol major penalty, and game misconduct, for sending Rob De Fulviis headfirst into the boards at 3:30, when they were chasing the puck into the corner. The Komets successfully killed off the power play, giving up only three shots on goal, then capitalized on a power play of their own at 13:11. With Blake Thompson in the penalty box for tripping, Shawn Szydlowski sent a slap shot from the right circle into the far side of the net. Winston Day Chief cemented the victory for the Cyclones with an empty net goal. They got another empty net goal, from Mitch Nylen, to make matters worse for the Komets. 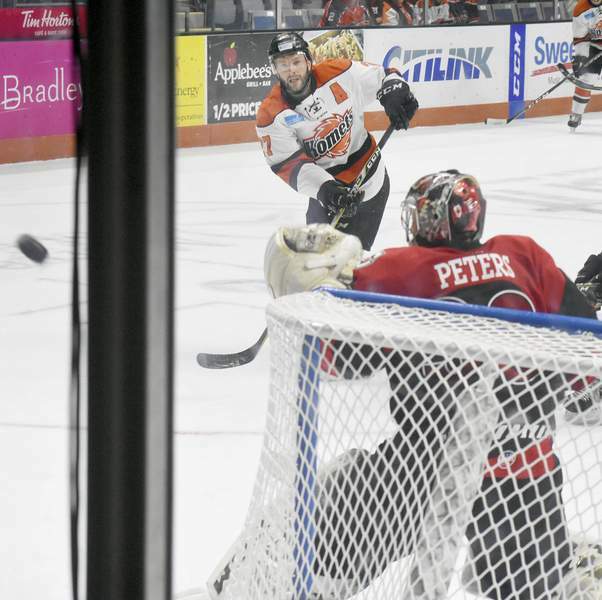 It was the Komets’ third game in as many nights, after they defeated the rival Toledo Walleye 5-4 at the Coliseum on Thursday night and won 4-2 at Indianapolis on Saturday night, when Dennis Kravchenko suffered an injury during a blue-line collision. Fort Wayne came into tonight on a three-game winning streak, their first of the season. Before the game, the Komets signed forward Joseph Widmar, 22, who had totaled three goals and nine points in 10 games this season with Peoria of the Single-A Southern Professional Hockey League. 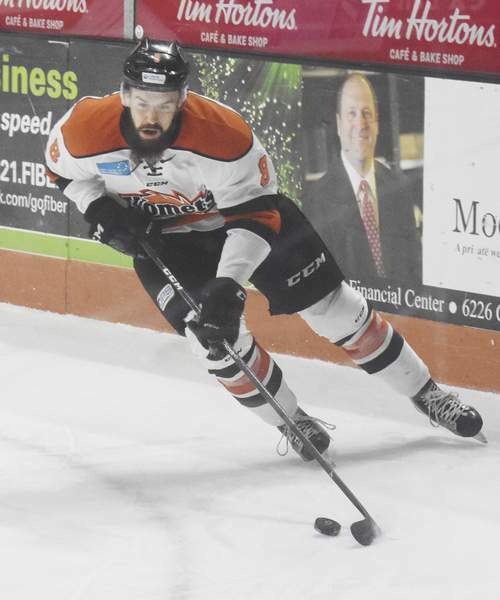 His addition came after the Komets signed Phil Bushbacher on Friday. Notes: The Komets played without Justin Hodgman (upper body), Dennis Kravchenko and Bushbacher, while Artur Tyanulin and Marco Roy were in the higher-level American Hockey League with Tucson and San Diego, respectively. … The referee was Liam Sewell. … Cincinnati was missing nine players, eight of whom were injured.